The walls and streets of Pompeii are amazingly well preserved. 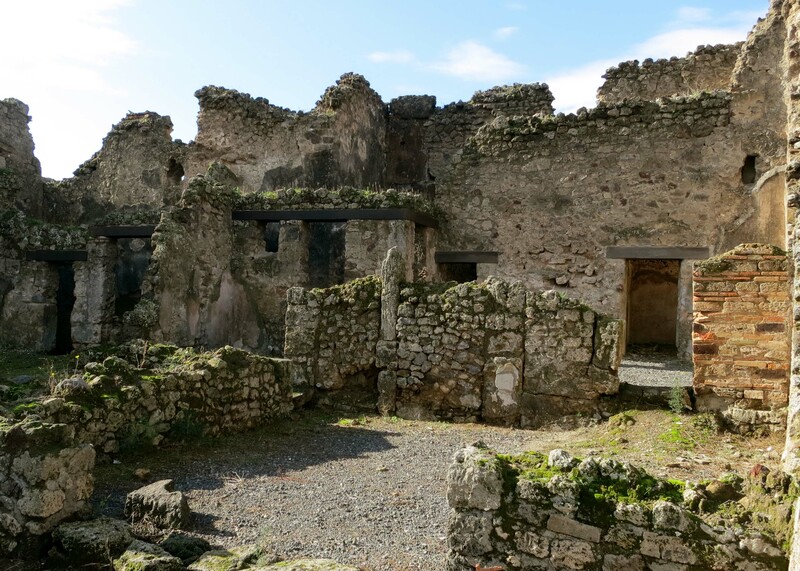 The magic of Pompeii is in how well it has been preserved. There are fewer ruins among the ruins. I know that sounds strange. But most ruins require considerable imagination to reconstruct the original site. This isn’t true of Pompeii. 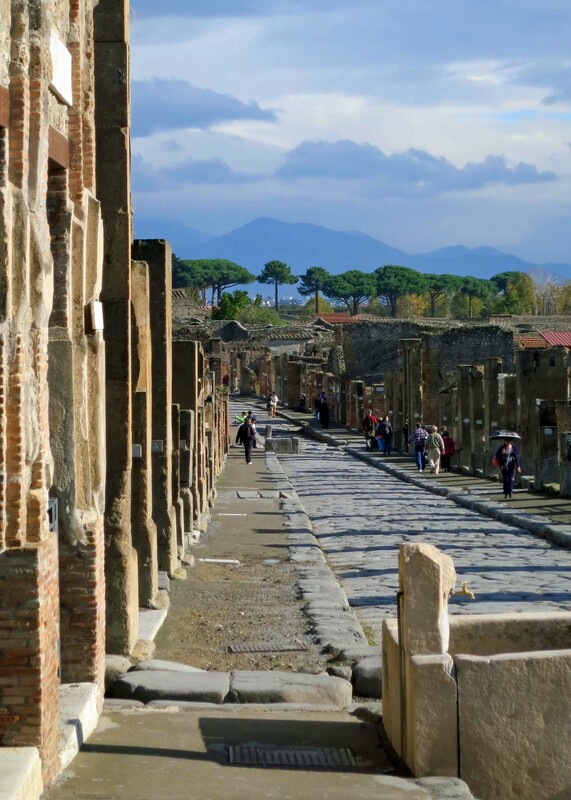 Many of the streets, walls and buildings are found in close to the same condition they would have been found in 79 AD before being covered by the eruption of Vesuvius. The preservation of bodies, as shown in my first blog on Pompeii, is even more impressive. 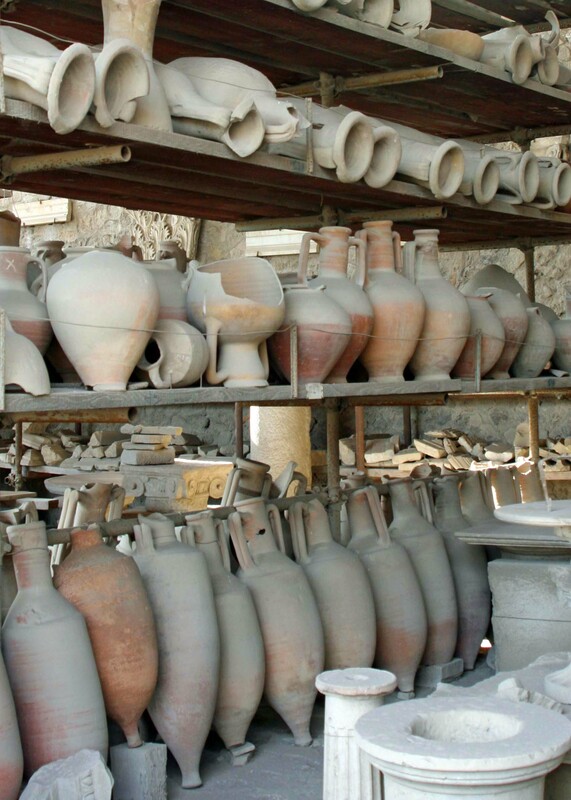 Thousands of storage and cooking vessels have also been found along with paintings, mosaics and sculptures giving us a detailed look into early Roman life. While much of what has been found in Pompeii can still be found there, much has also made it into museums around the world. 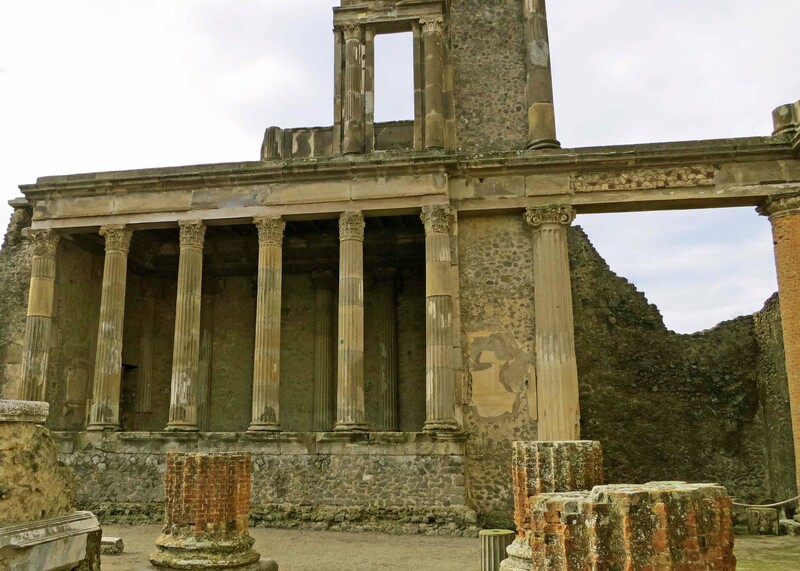 The Basilica in Pompeii was the center of government. It is centrally located next to the market and Jupiter’s Temple. 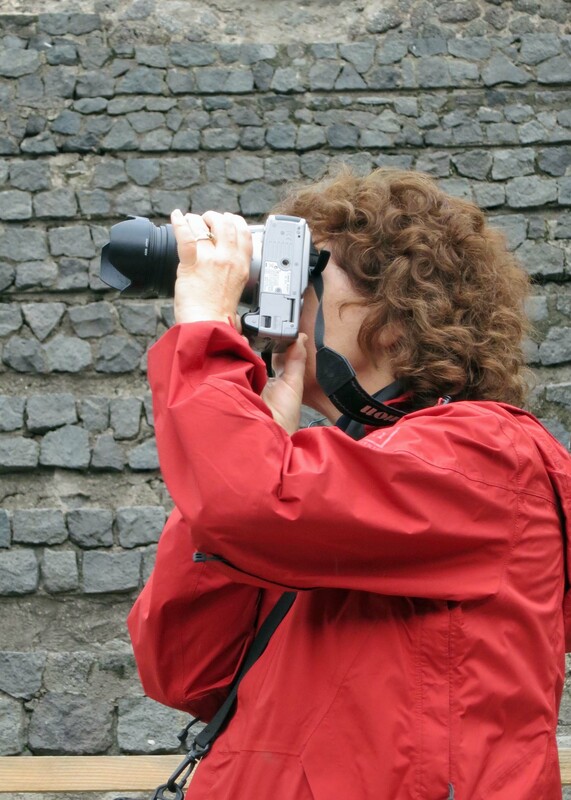 Since I use so many of Peggy’s pictures, occasionally I like to throw in a photo of her taking photos. This was along one of Pompeii’s walls. I found the detail in this Pompeii wall decoration impressive. It had a plastic cover to protect and preserve it. NEXT BLOG: We visit the excellent Archeological Museum of Naples. 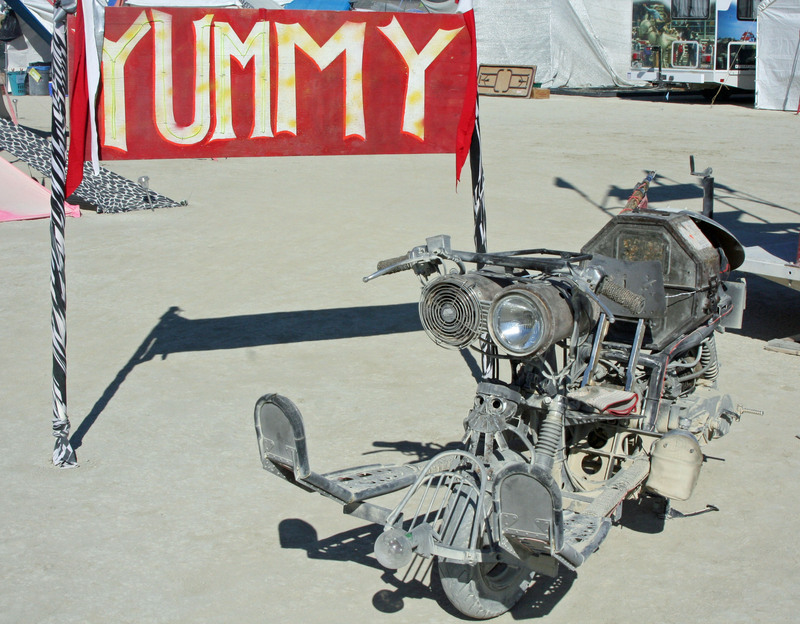 The mutant vehicles at Burning Man 2012 provided ongoing amusement, as they always do. I encountered this Woolly Mammoth at the port-a-potty. Later he came down our road. I was standing in line for the port-a-potty when the Woolly Mammoth with massive tusks came by and dropped off a half of dozen people to join us. 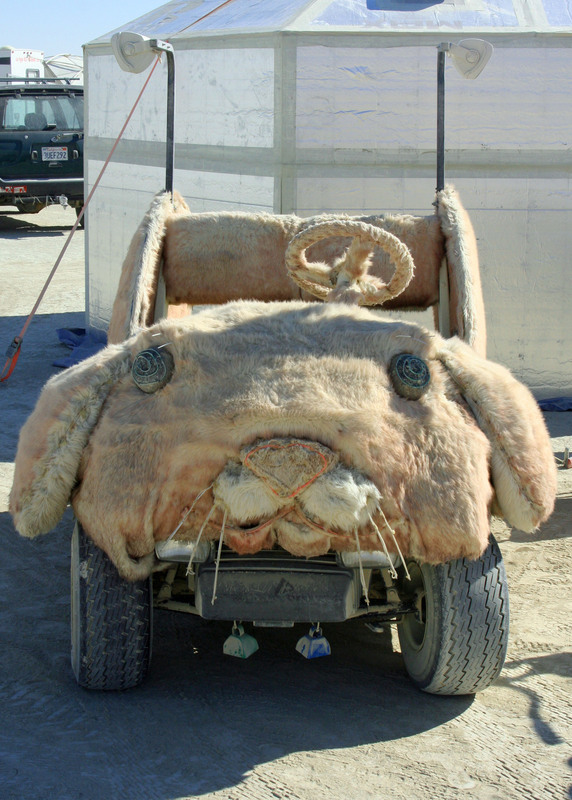 He was one hundreds of wonderfully imaginative ‘mutant vehicles’ that provided transportation across the seven square miles of Black Rock City during Burning Man 2012. 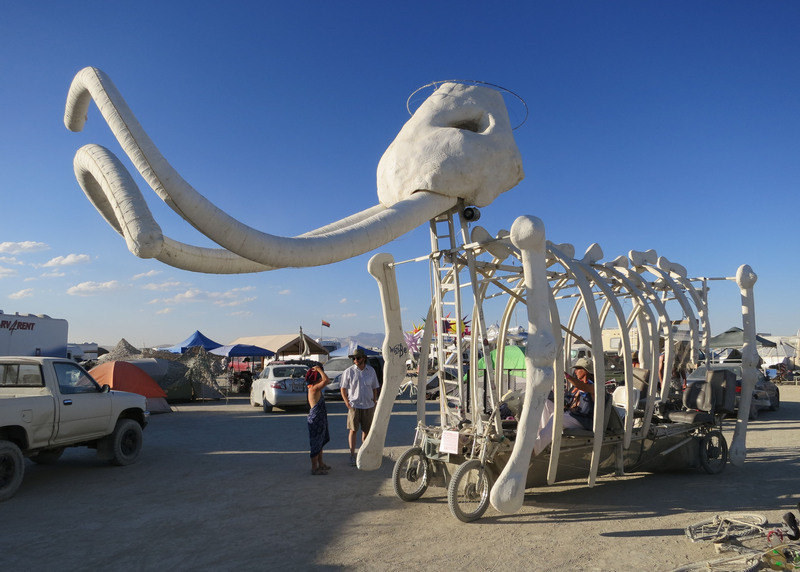 At any given time of the day you find these Black Rock City licensed vehicles parked in camps, driving up and down the roads, and wandering willy-nilly across the vast open spaces of the Playa. They range in size from one-person scooters up to fifty-person busses. Each one looks like something it isn’t. There are dogs, cats, rabbits, flowers, jungles, bugs, fish, dragons, stagecoaches, ships, yachts, and even a wart hog. The list goes on and on. 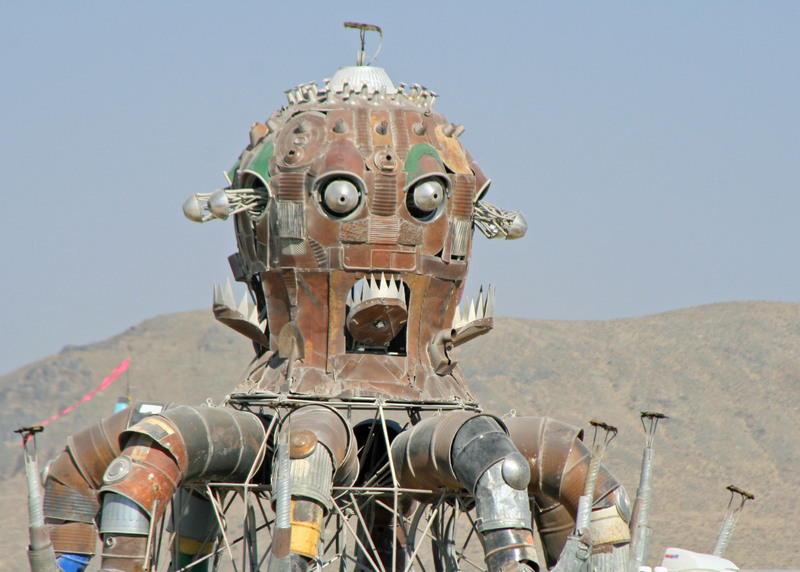 One of the main attractions at Burning Man 2012 was a fire shooting steam punk octopus that went by the name El Pulpo Mechanico. Created by Duane Flatmo from Humboldt County, California, El Pulpo’s eight tentacles shot ten-foot high flames into the air. 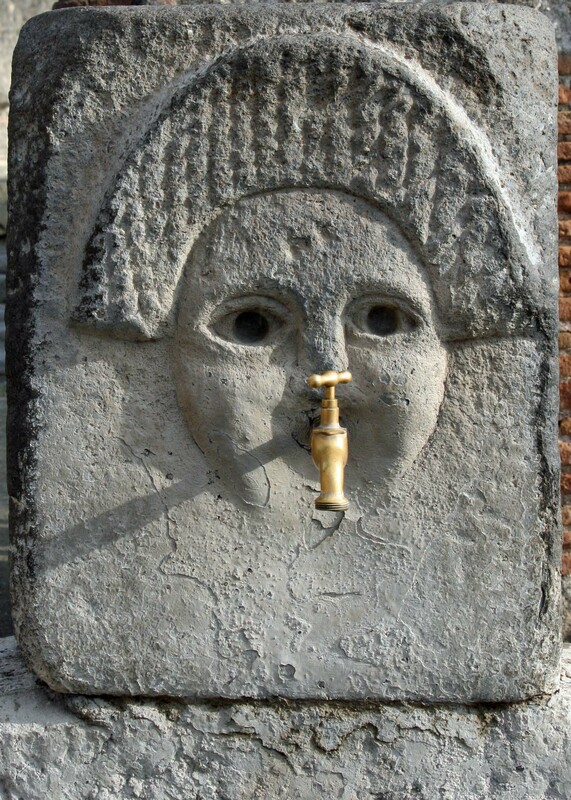 His head added a thirty-foot spout. A typical night of flaming used some 200 gallons of propane. 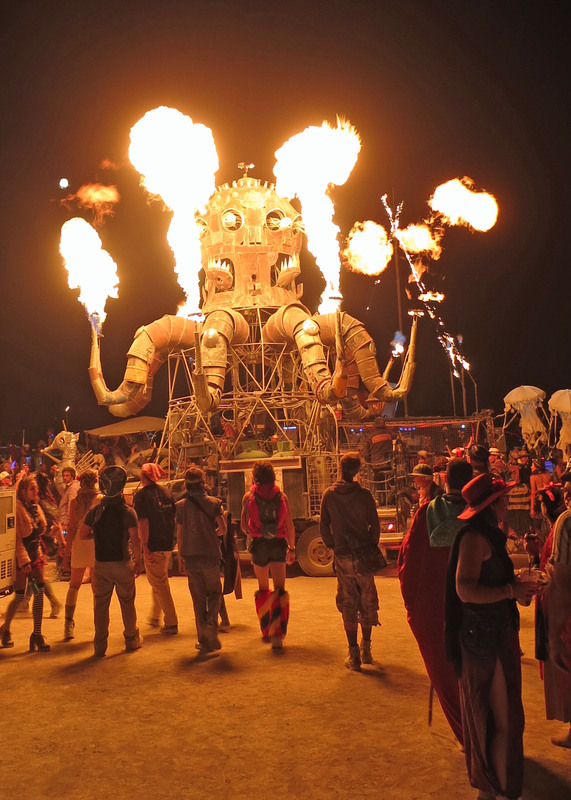 Here, our flaming friend, El Pulpo Mechanico, gathers a night time crowd of Burners. 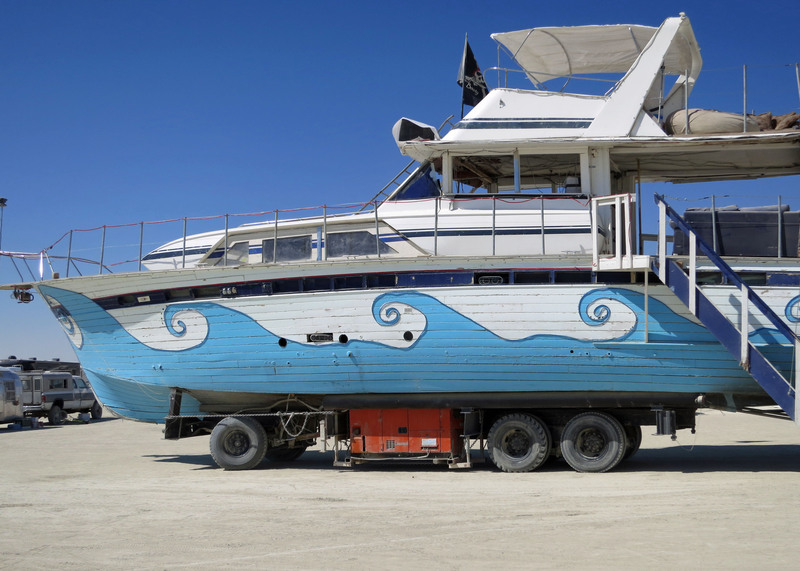 Some Burners at Black Rock City require a yacht for transportation. This boat is named Christina. 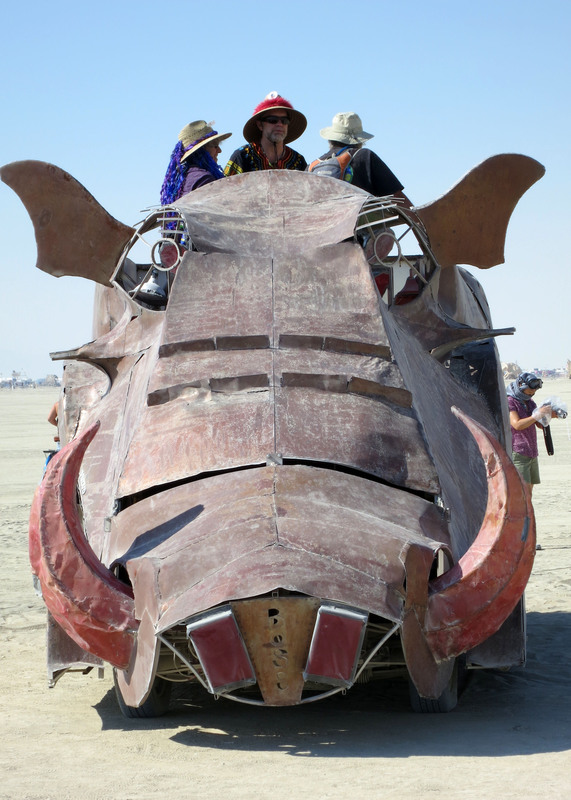 We were admiring theBurning Man 2012 Temple when this wart hog stopped by for a visit. Climbing on this orange bus just has to involve a ride to somewhere mysterious and wonderful. 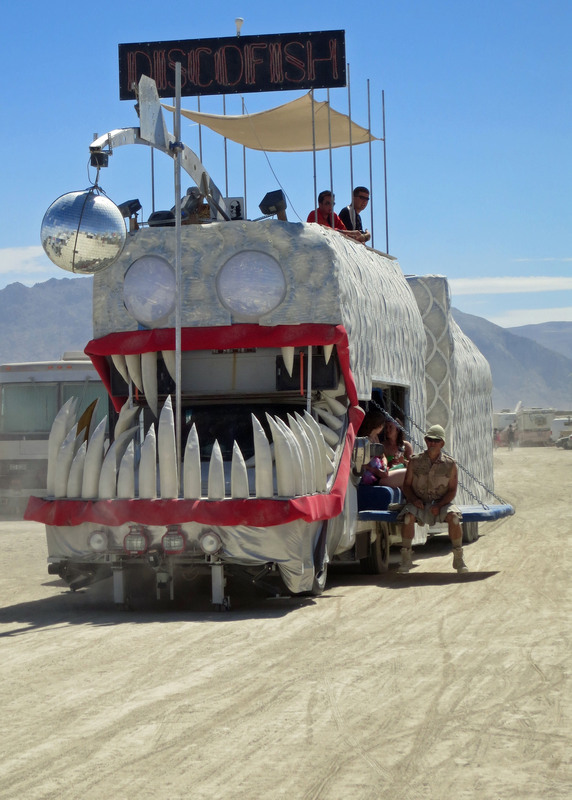 Check out the toothy grin on this Burning Man 2012 vehicle. The creature’s name is Disco Fish. 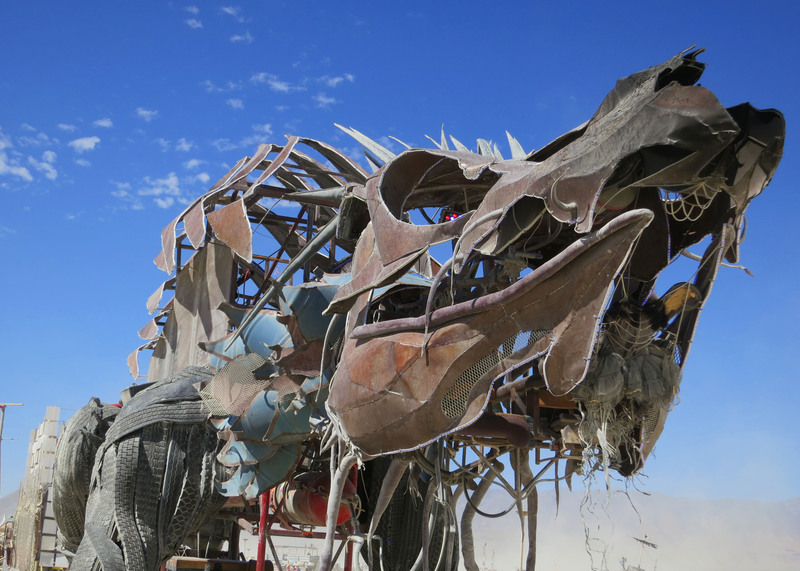 Sometimes mutant vehicles at Burning Man can appear downright scary, such as this dragon. Flame shoots out of its mouth at night. Note his tire tread skin. 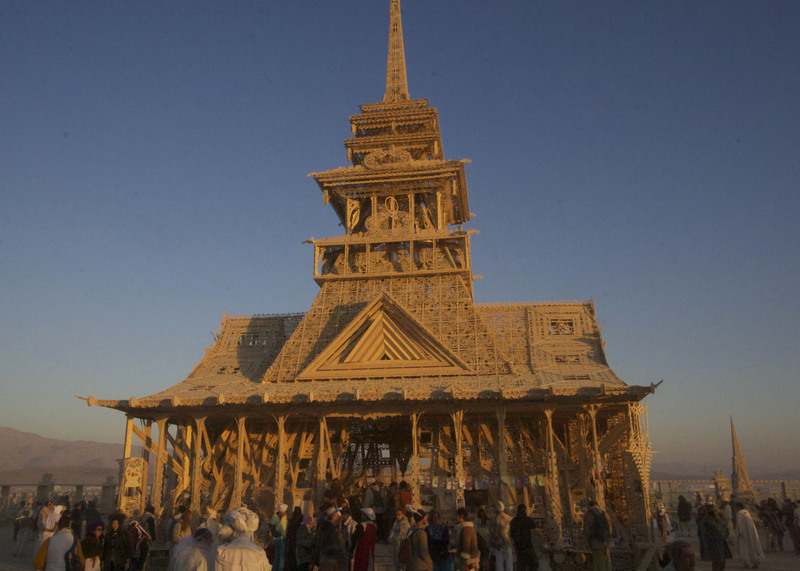 The 2012 Temple at Burning Man captured in the early morning light by my friend Tom Lovering. The courtyard and Temple are already filled with visitors. 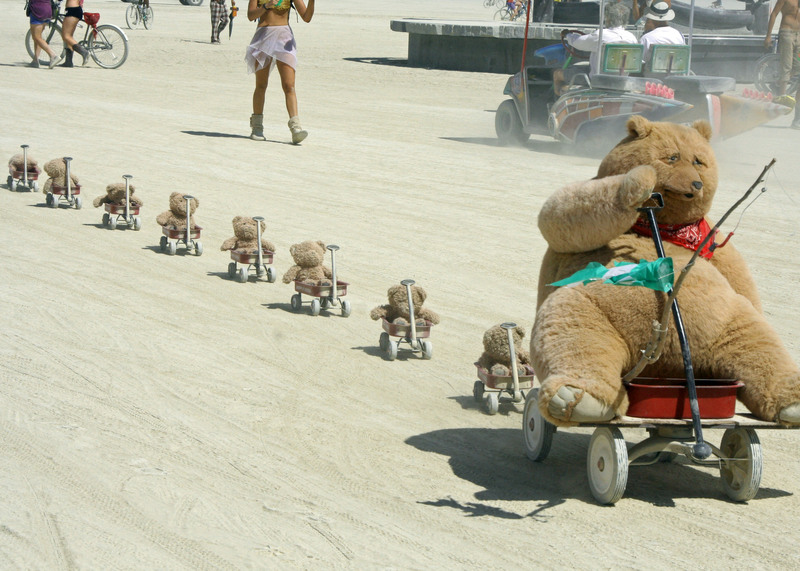 My first trip to Burning Man in 2004 became a quest. A neighbor of mine, a veteran Burner, suggested I would enjoy the event. He was a strange fellow. I guess he thought I was too. His description of Black Rock City reminded me of the Mos Eisley on the planet Tatooine, the Spaceport where Luke Skywalker began his journey to the outer worlds. Strange creatures resided there. Adventure beckoned. Most quests involve a similar location, a jumping off place between the world you know and wherever it is you are headed. Your challenge, if you accept it, is to go out into the beyond, do battle with the bad guys, and come back with something good for your community. I didn’t find any bad guys at Black Rock City but I did have a wonderful time. And the journey expanded my perception of reality, which is always a good thing. I returned to Sacramento and immediately begin recruiting friends to go with me the next year. 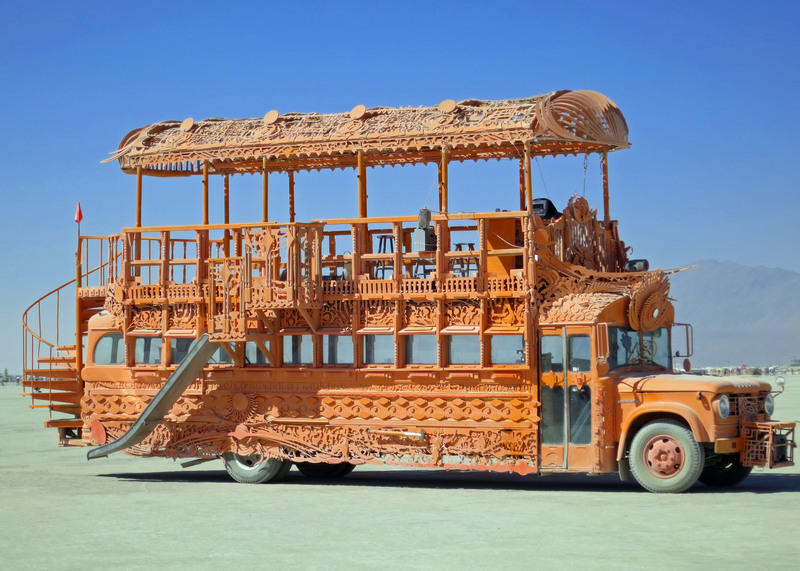 Today I regard my treks to Burning Man as exotic, art-filled vacations with a dash of pilgrimage thrown in. The pilgrimage part involves visiting the Man and the Temple. 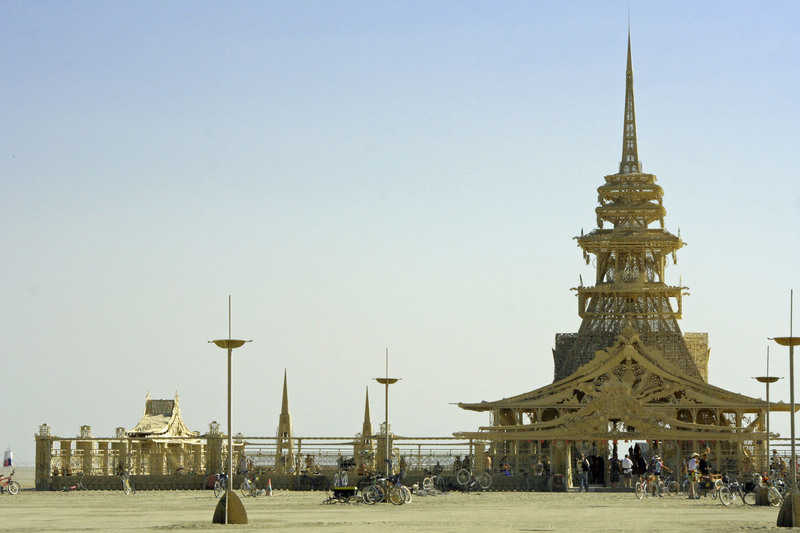 Today’s blog will feature the Temple, Burning Man’s spiritual center. It is the place on the Playa where Burners go to say goodbye to loved ones who have passed on or to simply give thanks. Visiting is a moving experience that I believe people of all faiths, or none, can relate to. 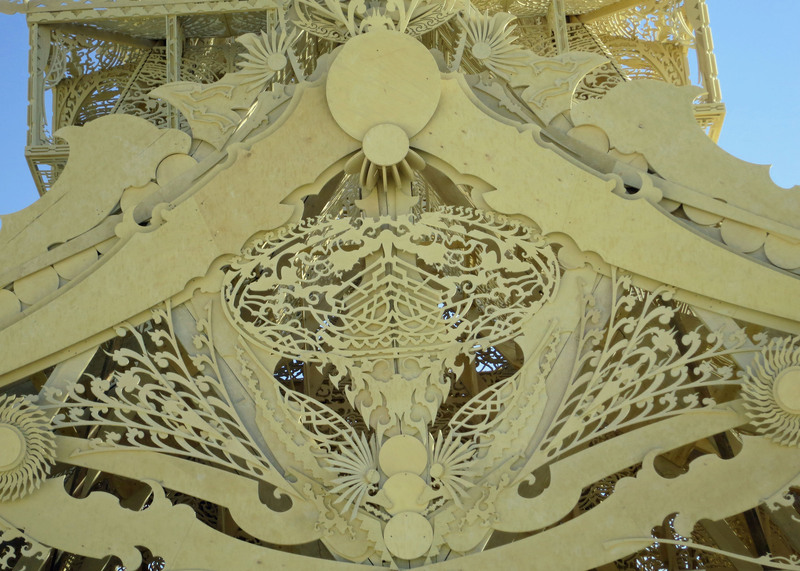 The 2012 Temple at Burning Man was exceptionally beautiful. Reflecting an oriental theme, its spire reached for the sky while its large courtyard opened to the desert and welcomed visitors. 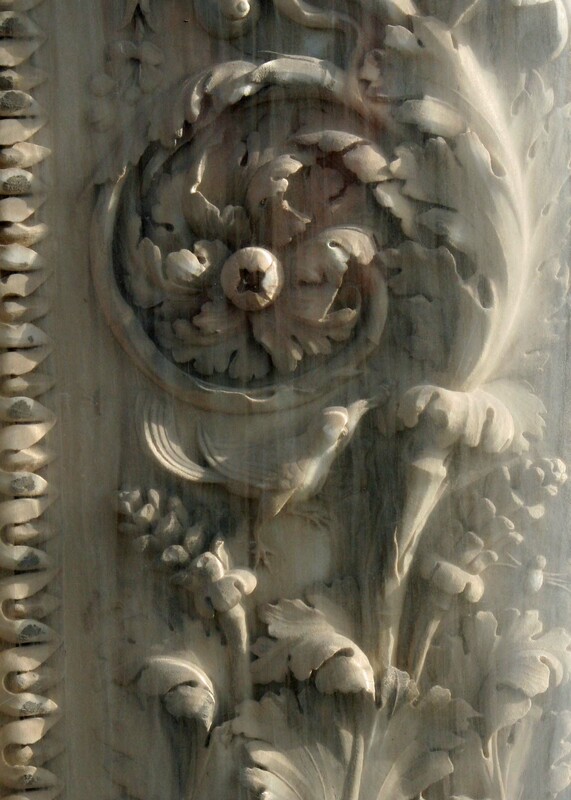 Intricately carved wood invited thousands of messages and photos about parents, friends, lovers, children, husbands, wives, other relatives and even cherished pets. 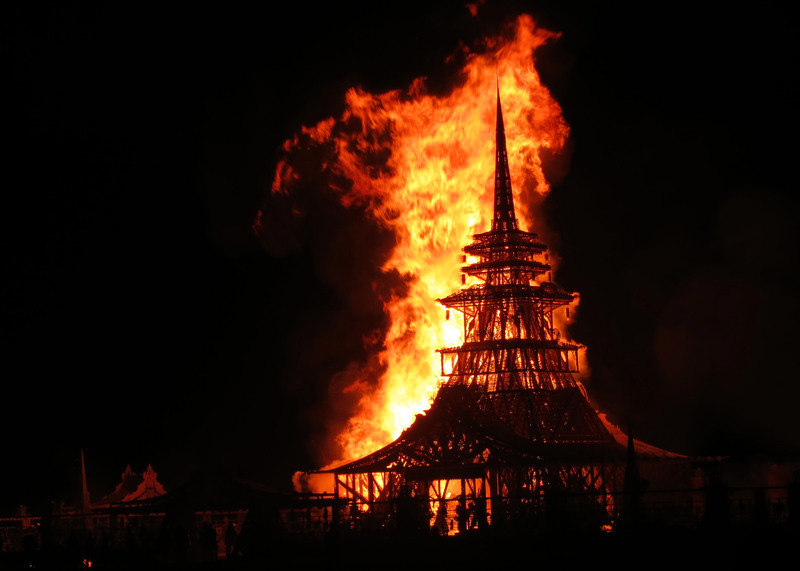 Normally raucous Burners become quiet when they enter the Temple Grounds. While it isn’t a place of formal worship, it is a place of quiet meditation, reverence and respect. People sit quietly, post messages, or wander around and read what has been written. 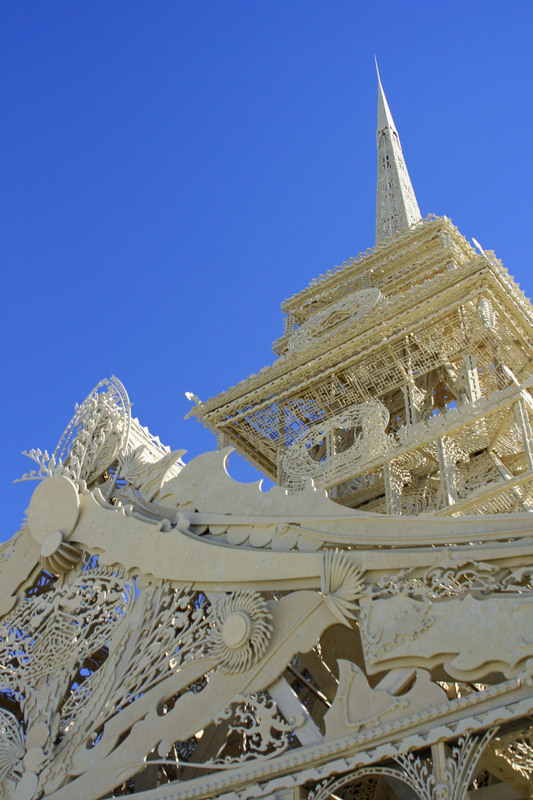 The following photo essay is designed to capture the essence and beauty of the Temple in a way that words can’t. My friend and fellow Horse-Bone Camp member, Tom Lovering of Davis California, got up at 5:30 AM on Wednesday to catch the sunrise pictures. My wife Peggy and I took the day, night and burn photos. 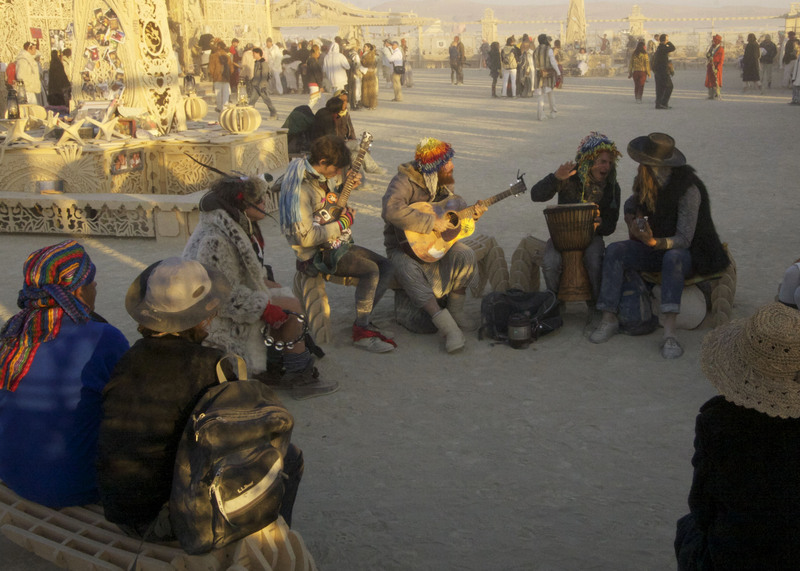 Music is found everywhere at Burning Man, including the Temple. I love the obvious joy of these performers caught on camera by Tom Lovering. I also think this photo provides a good perspective on the size of the 2012 Temple’s courtyard. 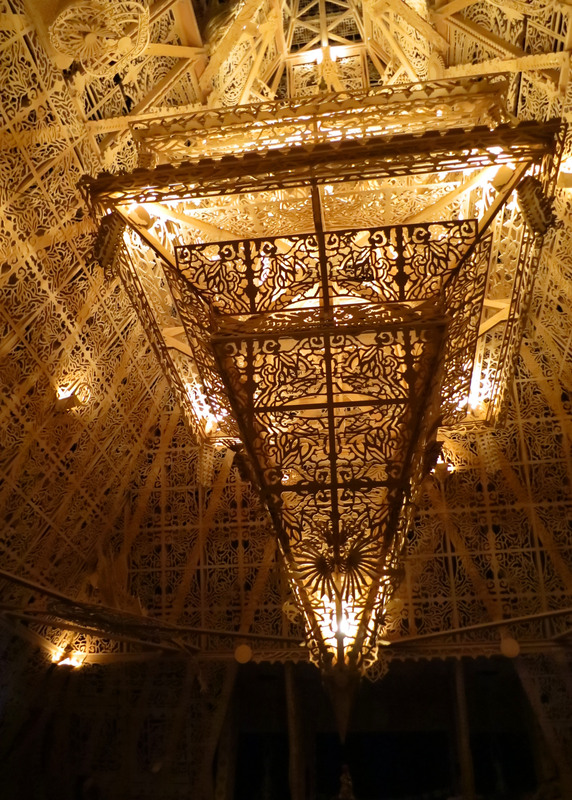 I took this photo of the 2012 Temple at Burning Man to show the intricate wood work. Much to my delight, the light shining through created a sense of eyes creating a cat-like face. 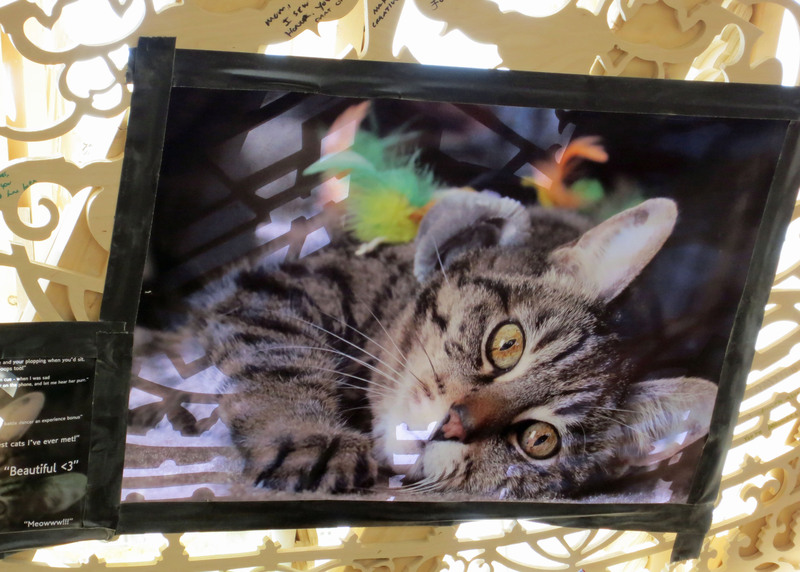 Speaking of kitties, the people owned by this cat memorialized her in the Temple with this picture. Thousands of Burners use the Temple to say goodbye to relatives, friends and pets who have passed on with messages of love and gratitude. I took this photo to provide an idea of the number of messages Burners leave for loved ones. 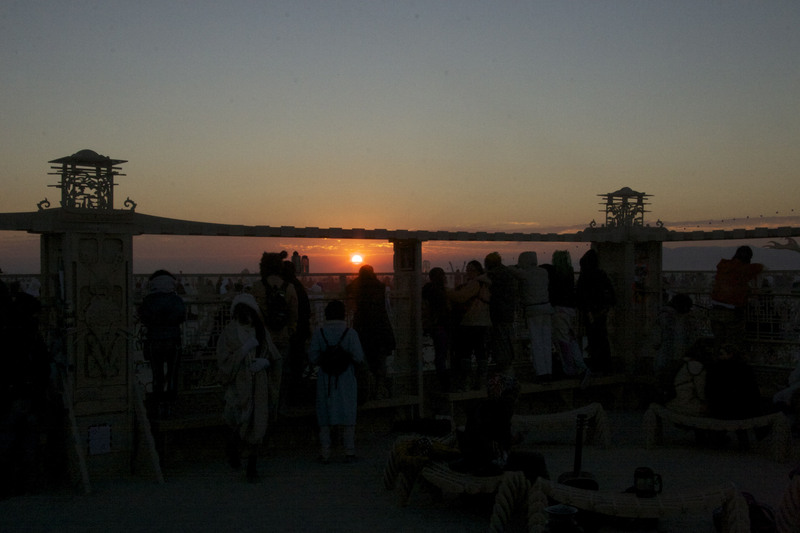 Previous photos have shown the size of the 2012 Temple of Burning Man and its courtyard. 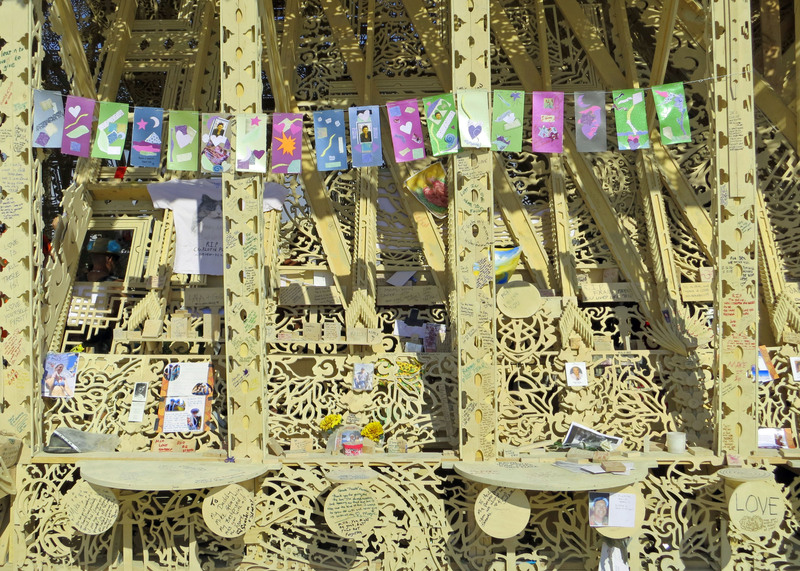 By Sunday, when the Temple was burned, close to every inch of reachable space on the inside and outside of the Temple plus structures in the courtyard had been covered with messages. 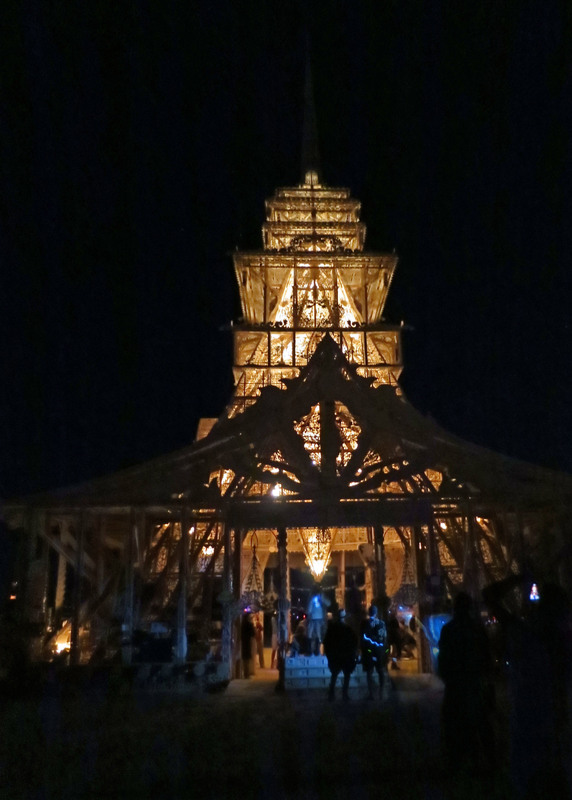 The 2012 Burning Man Temple at night. 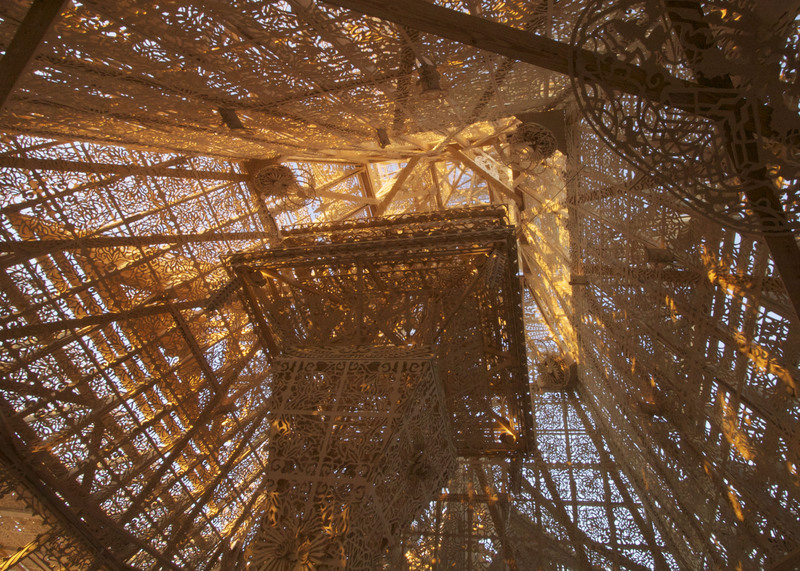 A night-time view from the inside of Burning Man’s 2012 Temple. 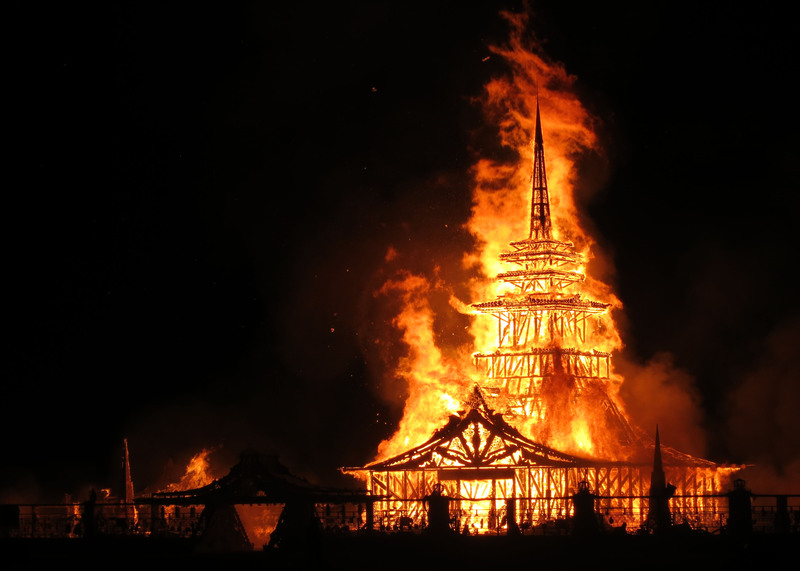 Things burn at Burning Man including the Man and numerous works of art. Impermanence, deconstruction and celebration are all involved. The Temple has these elements, but it also includes the burning of the thousands of messages, sending them skyward, or Heavenward if you prefer, and providing closure to those left behind. Silence accompanies the burning of the Temple. No mutant vehicles spout fire, no music is played, no Burners dance. Only the sound of crying or the shouted “I’ll miss you,” breaks the stillness. We too have honored those who have passed on. This year we remembered my sister’s Mother-in-Law Betty, a woman full of life who had adopted us all as family and who had passed away shortly before Burning Man 2012 began. Go in peace, Betty. Eventually, all that is left of the Temple and the courtyard is the structure… and then, it too collapses, returning to ash and dust. 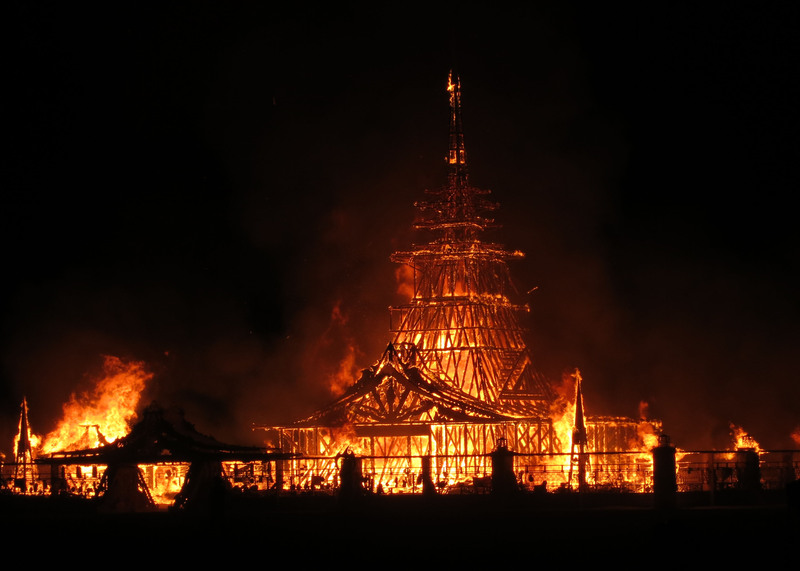 A very special thanks to David Best from Petaluma California, the architect and builder of the 2012 Temple at Burning Man, and to the Temple Crew that devoted thousands of hours to putting the magnificent building together.